Early in the Second Act, three thugs discuss breaking into a convent, their entire strategy hinging on wooing the nuns to let them through without the slightest hesitation. In a rhythm and blues number called, Lady in the long black dress, the men take turns in telling the others how to really do it. “My name is Bones and I’m a Libra. I dig sunsets and strolling on the beach, and loving my neighbor as myself; and right now, baby, I’m standing next door to you,” goes Bones, adopting an ‘80s boy band suavity — husky voice, calculated smirk, and the gait of someone who might be having an upset stomach. That scene pretty much defines the nature of Sister Act, the stage adaptation of the 1992 blockbuster film starring Whoopi Goldberg. Its intention is clear: to charm. Not exactly to wow. The storyline is straightforward, with no converging plots, twists or flashbacks; and the characters sit somewhere between stereotypes and caricatures. It’s only a question of, Will they pull it off? Will they manage to turn the charm switch on? The Goldberg-produced musical debuted in the mid-2000s, over a decade since the film’s release. 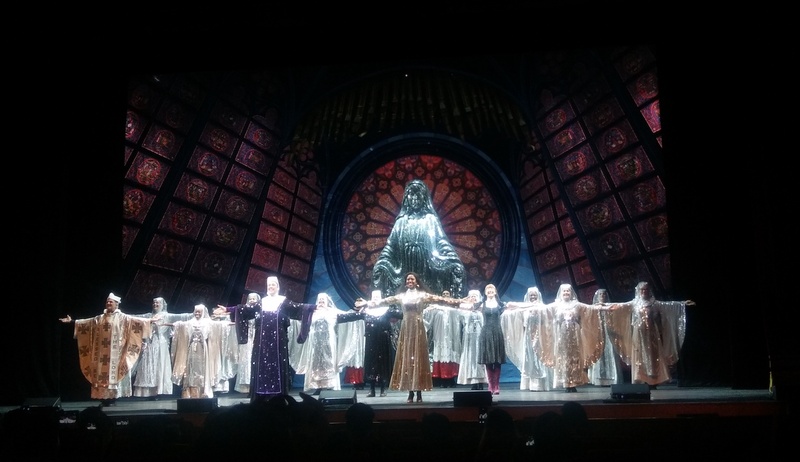 Now it’s enjoying an international tour, with a two-week run in Manila that closes on July 9th at The Theater at Solaire. The time gap doesn’t matter, apparently. Sister Act the movie has made such a huge impact that its appeal remains strong 25 years later. All it takes is the title and the promise of kooky singing nuns to get people interested in its stage counterpart. Someone asked me, “Is it as good as the movie?” I think it’s never fair to compare an adaptation to its source material, though one has to wonder what the new medium has to offer. Caught the gala performance of "Sister Act" the musical last June 29 at The Theater at Solaire. You might imagine that with the powers that be at the helm of this production, you’ll find a glorious, jaw-dropping set design and costumes. Not quite. The stage is rather bare except for a towering, not to mention rotating — and glittering — figure of The Blessed Virgin Mary. In an era where theatergoers have witnessed actors fly onstage and gotten wet with fake rain, a 16-foot glammed-up Mama Mary doesn’t impress. Then again, visual spectacle is the least of the show's priorities. Anyone who has seen the film may have already forgotten bits and pieces of the story, but I bet that, along with the harmless naughtiness brought by a colorful soul into a nunnery, they remember the music and how it made them feel. As it was onscreen, so it is onstage. Music continues to be a strong selling point. Those who’ll catch the musical to hear their favorite numbers from the film sung live, however, will be disappointed. Or not: Alan Menken’s original score and Glenn Slater’s lyrics are equally infectious. Watch out for Rebecca Mason-Wygal (Mother Superior) and her interpretation of Here within these walls. Arguably the brightest spot in this limited run, Rebecca brings humanity to her character that her scenes are some of the show’s most touching. As a leader she’s stern yet confused. She remains the voice of reason, even as her internal voice doubts God. And boy can she crack a joke! If Sister Act is going to be memorable, it’s all up to the performers. The melodious songs are there; the script, intended to tickle and tug at the heartstrings, is there. The ensemble only has to show up with a little more fire. What’s gained in this theatrical translation is that church vibe. Regardless of your faith or musical preference, you can’t deny the pleasures of listening to a choir and singing along with a community, smiling on the side. You’ll have that here, for sure — and then some. But nothing more to elevate the spirit to high heavens. This weekend, attend mass if you want to contemplate God and watch Sister Act if you want to have a good time. If you're looking for catharsis, search elsewhere.